Ironweed is also known as Tall Ironweed. Herbaceous perennial which can reach a height of 10 feet. Leaves: leaves are alternate, 3 – 4 “as much as 10 inches in length. Each lanced shaped leaf is very finely toothed and downy on the underside. Leaves are attached directly to the stem. 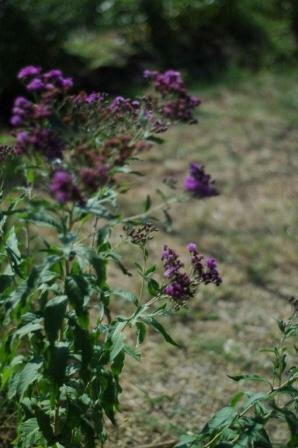 Flowers: Flowers are deep purple. Blooms first appear in mid summer and continue into mid fall. Individual flowers are tiny and this species usually has from 13 to 30 flowers per head. The heads are about 2 inches wide when fully opened. The bracts on the flower heads are blunt tipped. Habitat: Moist fields or open woods. Often seen in meadows and fallow fields the rich purple of the flowers and the tall straight stems make this plant easy to spot. The stems can be used for kite building. Culture: Durable and easy to grow in full sun in most soils. Prefers ample moisture but is also quite drought tolerant. 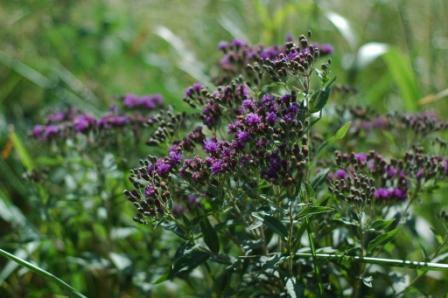 Uses: Some spices of Ironweed have been used to treat stomach problems. Native Americans may have used the root to treat post childbirth pain and to restore regular menses. 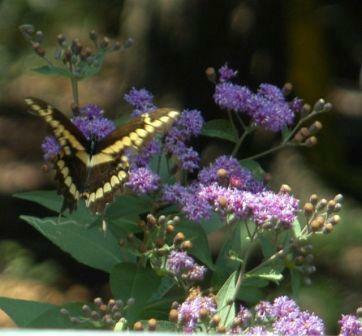 Ironweed is an excellent nectar plant and butterfly attracter. Plant with goldenrod for a dramatic effect.